Virgin Atlantic launches its new Upper Class Suite! 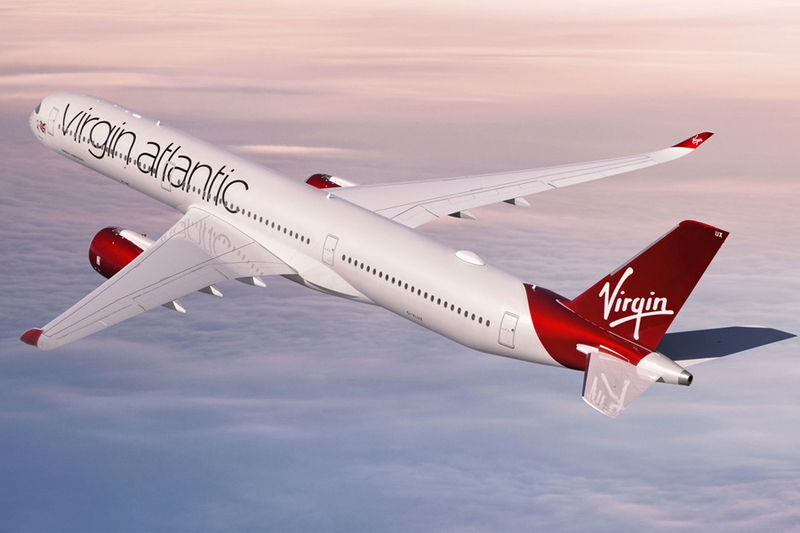 Virgin Atlantic has just launched its new Upper Class Suite, as part of the launch event for its new A350-1000 aircraft. Let’s take a look! These two articles focus on the new Upper Class Suite. Rhys is at the official launch event tonight and will bring you his thoughts on Wednesday on the party and the changes to the rest of the aircraft, since this is a complete makeover. Take a look at our Instagram page – click here – because Rhys has already posted a ‘story’ video (click on our logo to see it) from the event. 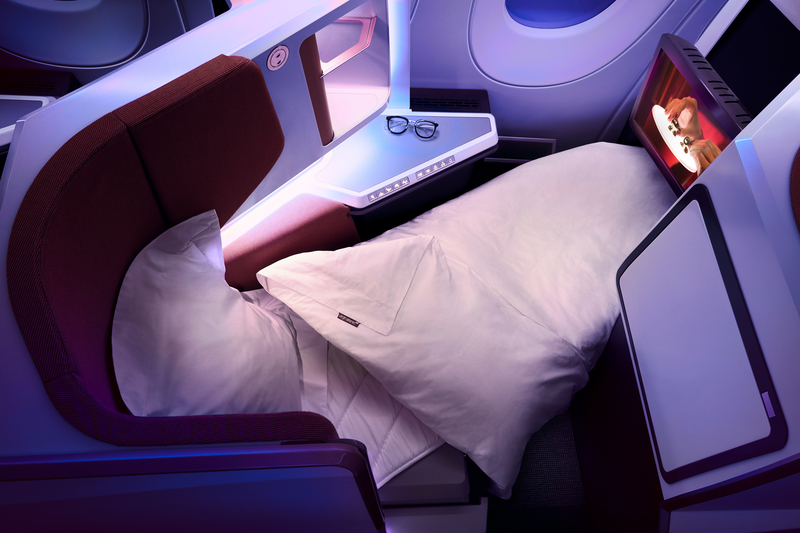 This is an exciting time for UK business travellers, with both British Airways and Virgin Atlantic launching new business class seats within weeks of each other. Whichever seat you prefer, the real winner is you, the passenger, since both airlines have taken major steps forward. Before I go on, I want to be clear that I’m not going to pick a favourite between these two new seats. I have been able to sit in the new Upper Class Suite in an impressive training cabin that was built inside the Virgin Atlantic training base in Crawley. I have not seen the British Airways Club Suite in the flesh, only via a VR simulator. I don’t know how it feels to sit in it, and some of the things I think I like and dislike about it may not be accurate when I try it. As well as the pictures below, some more should appear on our Instagram feed (click here) during the evening from the launch party. Part 2 of this article has an image of ‘The Loft’. 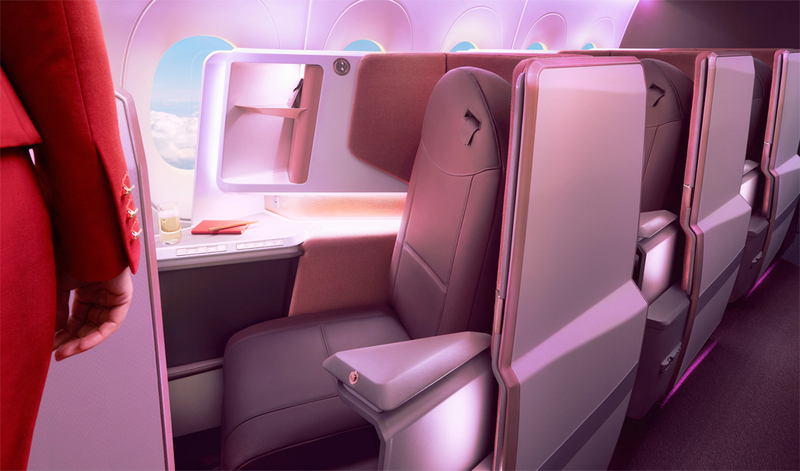 The seat is a bespoke Virgin Atlantic design, manufactured by Safran. No-one else is flying it. Each suite has half a door! The A350 cabin will have 44 Upper Class Suites across 11 rows in a 1-2-1 format. The new Suites have some interesting features which I focus on in a minute. Let’s just look at the general layout for now. The window suites are a standard reverse herringbone design, familiar from many other aircraft. Your head is near the aisle, and the seat is angled towards the window. Your feet disappear into a cubbyhole under the back of the seat in front of you. In the middle rows, things are different. The traditional format is that your head is next to the aisle and your feet are angled inwards. This means that your feet are very close to the feet of your neighbour, but your heads are about four feet apart. Virgin Atlantic has reversed this model. You sit so that your head is in the centre of the row and your suite is angled towards the aisle. For couples, this is a significant improvement over BA’s Club Suite. It is virtually impossible to talk to your seat neighbour with Club Suite, because your head is so far away. It is easier to have a chat to the person across the aisle than it is to chat to the person next to you in the middle block. If you obsessed with privacy above anything else, you will prefer Club Suite. High walls, a fully closeable door, no ability to speak to anyone else. But I doubt anyone so obsessed with privacy has been flying either Club World or the current Virgin Upper Class suite, given how open they are. Virgin Atlantic also has a higher percentage of leisure customers, and these passengers are looking for a more social travel experience. This also explains why the airline has introduced ‘The Loft’, which I will cover in detail in Part 2. I have to admit that the Upper Class cabin looks fantastic. Virgin Atlantic has its own in-house design team and they have done a great job. There is a lot of colour used, but nothing too bright. It is a sophisticated palette of soft golds, chocolate browns, ‘polished’ whites and the traditional Virgin Atlantic red and purple. The team told me it was inspired more by hotels, high end retailers and luxury cars than other airline cabins. It does feel like the airline has ‘grown up’. The level of craftsmanship and finish is very high end. The leather appears to be high quality, with the seats clearly sharing some DNA with luxury cars. The stitching looks great and there are little flashes of Virgin red popping out in unexpected places. One of my potential criticisms of BA’s Club Suite is that it looked very grey on the VR simulation, with no colour at all apart from a few touches of navy. The new Virgin Atlantic cabin feels substantially richer in tone, with ‘The Loft’, which I will come to in Part 2, decorated in deep purples and golds. It is worth mentioning that the different seat fabrics in Economy have also been designed in-house, with each one a mix of warm colours. It looks good. 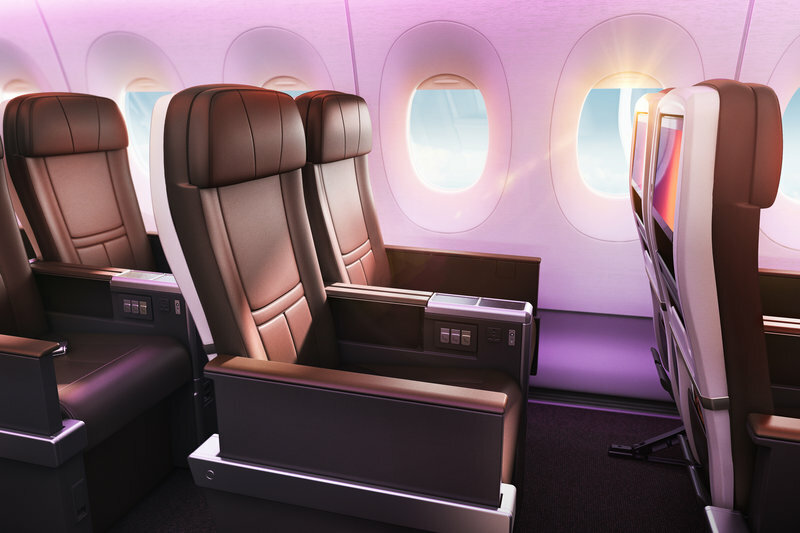 The Premium cabin – image below – continues the riff on automotive inspired leather and trim, with smart ‘marble-look’ finishes on the tray tables and surfaces. 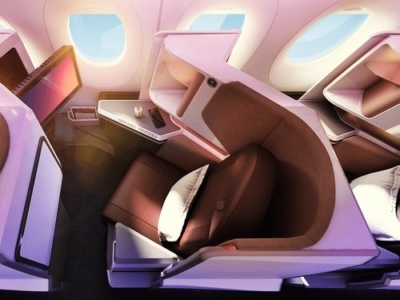 The new Upper Class Suite is manufactured by Safran, via the Zodiac Aerospace business it acquired in 2018. Safran is responsible, amongst other things, for the Cirrus seat which features on the Air France Boeing 777-300ER, the American Airlines Boeing 777-300ER and Cathay Pacific’s Boeing 777-300ER and A350 fleets. 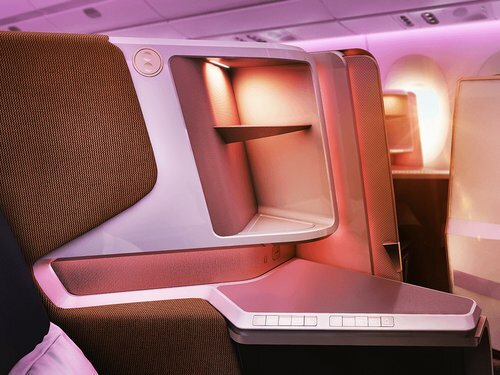 The Virgin Atlantic suite design is new. No-one else is flying it and apparently no-one else will be getting it. Let’s talk about the door …. The new Upper Class suite has half a door! I don’t mean that it only goes half-way up. I mean that it only goes half-way across. Unfortunately I don’t have an image yet. There are a few reasons for this. The first is that a full width door would have meant the loss of some personal space and a smaller seat. The second is that Virgin Atlantic felt that the crew service routine would be difficult with a full width door. The new Virgin seats are also not as high around the sides as the new BA Club Suite, and without high sides a full width door really is pointless. The half-door gives some additional privacy when sleeping and was seen as the best compromise. What else is new about the A350 Upper Class Suite? There is a huge increase in both personal space and storage space. There is no shortage of places to put your bits and pieces. The IFE screen is 18.5 inches – the biggest Virgin has ever installed. It is not yet certified for ‘gate to gate’ operation, as the screen needs to be flipped towards you and this is not allowed during take off or landing. This is still in negotiation, however, and Virgin hopes that it can get approval. As the screen can be adjusted and folded back you are not forced to stare at it for the entire duration of the flight. Unlike the existing Upper Class Suite, you can turn the seat into a bed whenever you want as you don’t need the cabin crew to do it for you. This is novel for Virgin passengers although the norm for everyone else! The tray table has an interesting feature that, as a tall person, I appreciated. It slides out towards you but can also slide on past you if you choose. You don’t need to have your legs blocked by the tray table if you’re happy to turn slightly to the side to eat. The bulkhead seats have a different design because there is no seat in front. Your feet do not disappear into a cubby hole and you have full movement to the left and right due to the larger footwell. There is also a different IFE screen which pops out, James Bond style, from a concealed slot. Whilst this wasn’t working on the mock-up cabin, you can apparently pair your phone with the IFE screen to use as a remote control. On-board wi-fi is, of course, provided. You will be able to pre-order pyjamas on night flights in your preferred size! In Part 2 of this article, I will introduce you to ‘The Loft’, the new social space that Virgin Atlantic is introducing on the A350-1000. Click here for Part 2. It’s in Safran’s catalouge, with bespoke finishes. It IS the Cirrus seat, just the latest version. Heavily customised – as you will see when you see how the herringbone works. Not really, because of how the reverse herringbone is, erm, reversed. Think you will find the Cirrus seat in this config was pushed by Safran/Zodiac in 2017. Virgin have slightly tweaked a catalogue seat in the same way BA did – but it seems to a lesser extent. It’s a catalogue seat no-one bought – as was the new BA seat. It is getting into semantics if you want to argue that buying a catalogue seat that no-one else is using is different to designing a seat from scratch, a process that even BA abandoned due to cost two years ago. It looks nice, but I get a little nervous when I see “cubby hole”. I flew Cathay Pacific business MAN-HKG in November and found that when reclined and relaxing my legs, one foot was touching the side of the cubby hole resulting in my ankle being slightly bent, which I found uncomfortable and not easily resolved unless I just didn’t use it at all. Uncomfortable enough to put me off wanting to use that cabin again. My legs are moderately long but not excessively so and I’ve not had a comfort issue in any other cabin setup. Flown in F with CX and SQ and J with BA, SQ and VS and all have been fine in this respect. I would love to give this new UC Suites a try as it looks fantastic. Guess there is no way of being able to tell beforehand how comfortable the foot resting arrangement will be but will be looking out for feedback on this. No articles today because of these last night? Seems like it. Strange there is no 3rd article though. And nobody seems to care about this new seat. It’s been on here since 7pm last night and hardly no comments. Surprising. Because this is a blog called “head for points”, and these articles don’t offer an opportunity to head for any. Earning and spending are both sides of the same coin, I think you’ll find. You may now be more inclined to pick up some Virgin points. Just relax, take a deep breath and go and do something more to your liking. I’m not remotely interested in discussing airline seat news guff either – but there are plenty of nerds around who like that kind of talk. Along with the points stuff. If Rhys gets his report from last night written we’ll run that during the day. We can judge the quality of the party by the arrival time of the article then… The better the party, the later he’ll start the write-up! “But I doubt anyone so obsessed with privacy has been flying either Club World or the current Virgin Upper Class suite, given how open they are”. I don’t agree at all, The current CW window seat is probably one of the most private seats in the sky. Yeah…but the other 6 seats in the row really aren’t. Precisely. And the window seats aren’t private during take off, landing, and meal service of you have a stranger in the adjacent seat. Plus people without status such as customers paying cash have to pay to select the few decent seats in CW. You would think BA would get to attract passengers who can choose where to spend their own money. Hence my rule; BA for redemptions, AA when I’m paying cash. Although I’ll seriously consider Virgin now. The coffin cabin looked awful. How do you get status without paying cash? Other than Prems or a gifted card from a GGL status comes from paid bookings, no? You can get status without spending your OWN cash, ie business travel. Never gonna fly Upper or First so not really interested. IS nothing else happening? Did it ever occur to you, that other people might be? Hilton 100% buy points started today, works out at 0.38p a point st today’s rate so £38.26 for the likes of Hampton by Hilton Newport East at 10,000 points a night is great. I have never flown Virgin and can’t see it changing – their route network is no match for BA, thus they can’t be the ‘main carrier’, so zero reason to ‘credit’ my Tier points to them. Would gladly fly for miles, but their abysmal 2-4-1 voucher is making it unlikely too. I have just racked up circa 40K miles and that voucher within a couple of months, but will likely let the voucher expire and convert the miles to Hilton or similar, while continuing earning Avios. I find myself tilting towards anti-Virgin simply because of the love affair it’s disciples have for it. But when it’s widely available I’ll give the new seat a go. I found the current seat to be pretty poor. The getting up to convert to bed, the feat knocked as people pass, just poor as I saw it. The LHR lounge and on-board service were very good, but the Delta lounge in Miami for the return was really poor. The window being blocked by the shelf thing (and it deffo will be blocking a window) will be annoying but no one is flying VS to look out the window at the mo! Just a bit confused by the image of the seat from above. I can see the pop-up IFE screen, but what is the other rectangular thing to the right of it? It looks a bit like a whiteboard. Is this the tray-table? Only negative I can think of from the images is the little storage box above the console. Seems like if this were removed, you’d have a much better view out of the window. As usual with seats like this, each row aligns differently to the windows. Some rows may be better than others for that. Having more detailed look, it seems like it the price we’ll be paying to have more space open above our legs. In other aircraft designs, this space would be open but covering much of the passengers behind legs. Rob, have you seen that you are heavily quoted in the Daily Mail: https://www.dailymail.co.uk/travel/travel_news/article-6901935/Inside-Virgin-Atlantics-new-Airbus-A350-cabin.html – why should they bother writing something when they can just include what you wrote. Pinnacle of your career, i’m sure!